Please help me welcome K. Mathur, whose book Never Mind Yaar explores what I thought to be thought-provoking Indian themes. My interview with her proves to insightful and interesting. Read on! I was born and brought up in Mumbai and have always felt a connection to the people and the city. I know Mumbai well, warts and all. Graeme Lay, a well respected New Zealand editor, and at various times, Reviewer of the Year at the Montana New Zealand Book Awards, Books Editor for North and South magazine and secretary of the Frank Sargeson Trust had this to say about my observations on Mumbai, "Mumbai is not romanticized, yet the author's perspective and insider information draw in both, the Indian and Western reader." As and when "Never Mind Yaar" becomes better known I would be keenly interested to know what the people of Mumbai feel about my depiction of their city. 2) Your book can be classified as young adult literature. Why did you choose this audience? I have, no doubt, written about three young girls from different backgrounds who meet and become friends at college, but the category for "Never Mind Yaar" is Contemporary Fiction and not "Young Adult" where one expects action from page one. "Never Mind Yaar" begins with a description of Gyan Shakti College, the first day of college and how the young girls meet (see the "look Inside the book" feature on Amazon.) The synchronised bombs that go off in Mumbai, the aftermath of riots between communities and what the principal of the college says to replace the hatred with healing is something a varied audience would enjoy. I daresay young adults would enjoy it too as they would the romance between Shalini and Bhagu, as well as Binny and Lou's improbable schemes to bring the two lovers together and Mem's determination to find her the best catch in town. One of my reviewers said she loved the folklore we were brought up with and that are woven into the story. My editor, Graeme Lay, did say that traditionally, these tales would be at the end of the book so as not to interrupt the flow of the story. But I felt I wanted them and the snippets of information where they were more relevant. I wonder what my readers think. 3) Your book explores arranged marriages. What did you want your readers to understand about this arrangement? Have you experienced an arranged marriage? Arranged marriages and love marriages have always co-existed in India. 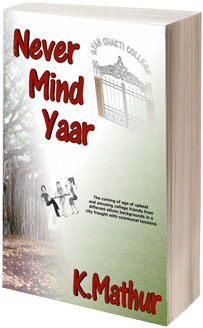 Take a young girl like Shalini, the main protagonist from "Never Mind Yaar" who is from a traditional, Hindu background. Under normal circumstances she would have no problems accepting her parents' choice of partner for her. The problem arises when, without intending to, she falls in love with Bhagu. She is torn between giving in to her emotions and resisting them. Her grandmother, Mem, wants a grand match for her and has chosen a space scientist from Sriharikota, the Indian space research centre. The tussle between Shalini and her grandma as well as the battle that rages within her, as her emotions fight her traditional upbringing, are dilemmas that many a young Indian girl faces today and make for a story relevant to contemporary India. As for my having witnessed an arranged marriage first hand, I can honestly say I have. I might even add, when I first saw the young bride I happened to catch the softest of glances she bestowed upon her new groom when she thought no one was looking. Although it was an arranged marriage, she was in love. 4) I loved Mem's character, the matriarch of Shalini's family. What does she represent in contemporary India? In a traditional Hindu family, mothers-in-law play a very important role in a new, young and vulnerable daughter-in-law's life. As she gets absorbed into the groom's extended family, the young bride has to adjust to a completely new environment and routine. More often than not, her husband goes off to work every day as she stays behind with her mum-in-law. Every family is different but the kitchen is where a large percentage of the women tend to spend a lot of their time. Simultaneously, the young couple are learning to adjust to each other, not the easiest of things to do anywhere in the world. It is a happy, yet stressful time for them and an understanding mother-in-law can only help. In Shalini's case her grandmother happens to be a strong personality who, no doubt, dotes on her grandchildren but isn't too fond of her daughters-in-law. It is up to her sons to tactfully ascertain they show respect for their mum, the un-declared head of their household, and at the same time, ensure their wives don't suffer because of her strong personality. Once the wives, including Shalini's mum, understand where their husbands are coming from, they too are better able to handle Mem's strong personality. 5) Bhagu wants to bring about societal change. How important is it for you as a writer to relay this needed change in India? * A multitude of different communities with their own languages and traditions living side by side since centuries. For most of us this creates no problems at all but, as the world is finding out today, we face racial (or communal) intolerance from a few. * Stark differences between the rich and poor. * Overcrowded cities; villages that lack infrastructure. * Extreme corruption in our government. The latest scam in the papers was the biliions of dollars siphoned off from the Common Wealth games budget. How do we overcome these problems? Some of us try to make a difference through NGOs and other charitable organizations. Yet others are overwhelmed by the nature and scale of the problems. Their solution is to feel defeated and move on with a sigh and a "Never Mind" hence the title of my book. "Yaar" simply means friend or pal in India. I feel it is best to get involved and unite to be able to make a difference. After all, whose voice is more audible? A billion lone individuals or a billion strong force? 6) What writing project are you working on next? Right now I am involved with "India Redefined" and in making my book available in India. I find Amazon's international shipping rates quite steep and have been assured by them that they are aware of this problem and looking into it. 7) What was the last great book you read? "Wings of Fire", an autobiography of Abdul Kalam, India's former President. The story is about how he established the Indian Space Research program - an absorbing tale and surprisingly warm and entertaining (as opposed to dry and highly technical) - a must read for anyone interested in India. Thanks for this interview, Khoty!